Jewish mathematician of the fifteenth century; probably lived in Lombardy. No Jewish author mentions him, nor is anything known of his life. That he lived in the middle of the fifteenth century has been concluded from the fact that, according to De Rossi Parma MS. No. 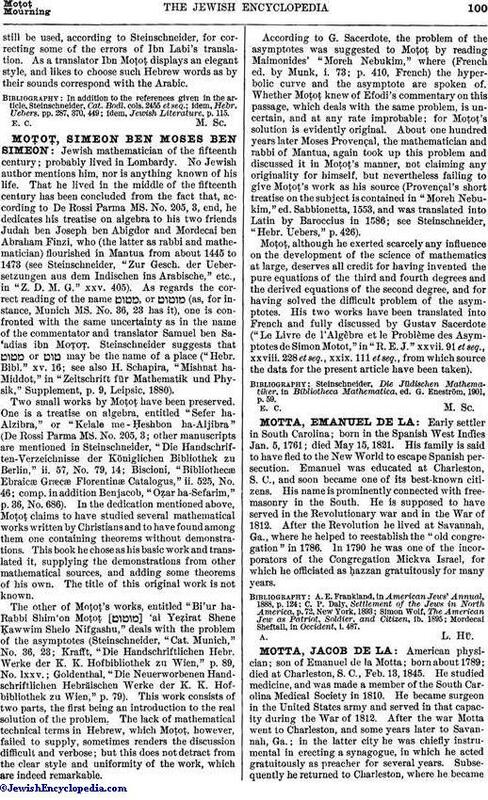 205, 3, end, he dedicates his treatise on algebra to his two friends Judah ben Joseph ben Abigdor and Mordecai ben Abraham Finzi, who (the latter as rabbi and mathematician) flourished in Mantua from about 1445 to 1473 (see Steinschneider, "Zur Gesch. der Uebersetzungen aus dem Indischen ins Arabische," etc., in "Z. D. M. G." xxv. 405). As regards the correct reading of the name , or (as, for instance, Munich MS. No. 36, 23 has it), one is confronted with the same uncertainty as in the name of the commentator and translator Samuel ben Sa'adias ibn Moṭoṭ. Steinschneider suggests that or may be the name of a place("Hebr. Bibl." xv. 16; see also H. Schapira, "Mishnat ha-Middot," in "Zeitschrift für Mathematik und Physik," Supplement, p. 9, Leipsic, 1880). Two small works by Moṭoṭ have been preserved. One is a treatise on algebra, entitled "Sefer ha-Alzibra," or "Kelale me - Ḥeshbon ha-Aljibra" (De Rossi Parma MS. No. 205, 3; other manuscripts are mentioned in Steinschneider, "Die Handschriften-Verzeichnisse der Königlichen Bibliothek zu Berlin," ii. 57, No. 79, 14; Biscioni, "Bibliothecæ Ebraicæ Græcæ Florentinæ Catalogus," ii. 525, No. 46; comp. in addition Benjacob, "Oẓar ha-Sefarim," p. 36, No. 686). In the dedication mentioned above, Moṭoṭ claims to have studied several mathematical works written by Christians and to have found among them one containing theorems without demonstrations. This book he chose as his basic work and translated it, supplying the demonstrations from other mathematical sources, and adding some theorems of his own. The title of this original work is not known. The other of Moṭoṭ's works, entitled "Bi'ur ha-Rabbi Shim'on Moṭoṭ [ ] 'al Yeẓirat Shene Ḳawwim Shelo Nifgashu," deals with the problem of the asymptotes (Steinschneider, "Cat. Munich," No. 36, 23; Krafft, "Die Handschriftlichen Hebr. Werke der K. K. Hofbibliothek zu Wien," p. 89, No. lxxv. ; Goldenthal, "Die Neuerworbenen Handschriftlichen Hebräischen Werke der K. K. Hofbibliothek zu Wien," p. 79). This work consists of two parts, the first being an introduction to the real solution of the problem. The lack of mathematical technical terms in Hebrew, which Moṭoṭ, however, failed to supply, sometimes renders the discussion difficult and verbose; but this does not detract from the clear style and uniformity of the work, which are indeed remarkable. According to G. Sacerdote, the problem of the asymptotes was suggested to Moṭoṭ by reading Maimonides' "Moreh Nebukim," where (French ed. by Munk, i. 73; p. 410, French) the hyperbolic curve and the asymptote are spoken of. Whether Moṭoṭ knew of Efodi's commentary on this passage, which deals with the same problem, is uncertain, and at any rate improbable; for Moṭoṭ's solution is evidently original. About one hundred years later Moses Provençal, the mathematician and rabbi of Mantua, again took up this problem and discussed it in Moṭoṭ's manner, not claiming any originality for himself, but nevertheless failing to give Moṭoṭ's work as his source (Provençal's short treatise on the subject is contained in "Moreh Nebukim," ed. Sabbionetta, 1553, and was translated into Latin by Baroccius in 1586; see Steinschneider, "Hebr. Uebers," p. 426). Moṭoṭ, although he exerted scarcely any influence on the development of the science of mathematics at large, deserves all credit for having invented the pure equations of the third and fourth degrees and the derived equations of the second degree, and for having solved the difficult problem of the asymptotes. His two works have been translated into French and fully discussed by Gustav Sacerdote ("Le Livre de l'Algèbre et le Problème des Asymptotes de Simon Motot," in "R.E.J." xxvii. 91 et seq., xxviii. 228 et seq., xxix. 111 et seq., from which source the data for the present article have been taken). Steinschneider, Die Jüdischen Mathematiker, in Bibliotheca Mathematica, ed. G. Eneström, 1901, p. 59.